Some animations studios, namely Pixar and Laika, want to tell heart-warming and emotionally complex stories of imagination and wonder, with colourful characters and strong morals for both children and adults – others, like Illumination, just want to have as much mindless fun as possible in an attempt to recapture the feeling of cartoon classics like the Looney Tunes, with story and character coming in a close second. Though each one of their films thus far has been rather large money-makers for the Universal-owned property, despite reviews that aren’t necessarily bad but aren’t stellar either, easily their biggest franchise to date is the Despicable Me series, with over $2 billion in the worldwide bank (including the 2015 spin-off focusing on those yellow pill-shaped franchise mascots, the Minions) and even a couple of Oscar, BAFTA and Golden Globe nominations, some of them for Pharrell Williams’ catchy chart-topper “Happy”. So, no matter whether or not you’re a fan of this series, or if you’re so annoyed by it you want to just blow your brains out rather than listen to that Minions gibberish speak again (and I can understand either), expect the third entry in the main series, simply titled Despicable Me 3, to contribute even more worldwide cash to that total – and while it might not necessarily have the heart of the first film (then again, none of the other films did either), it still does its hardest to have you giggling with silly laughter, and for the most part succeeding. It picks up from when the last film left off, with former supervillain Gru (Steve Carell) and his new wife Lucy (Kristen Wiig) working for the Anti-Villain League to stop evil villains from their wrath upon the world. Their latest foe is Balthazar Bratt (Trey Parker), a former 80s child star whose show was cancelled once he reached puberty, and has adopted the persona of his on-screen alter-ego to take revenge on Hollywood. However, Gru and Lucy are fired when they fail to capture Bratt in an opening sequence that’s basically the entirety of that first trailer (the one with the boat that floats with Bratt’s bubble gum), and things are looking down until Gru learns that he has a long-lost twin brother named Dru (also Carell), who is eager to carry on the family legacy of villainy despite Gru’s objections. As for the Minions (because I’m sure you all want to know what they’re up to), they quit when they realise that Gru is no longer going to be a villain, and so they go off on their own adventure, which at one point lands them in prison, because of course. Like I said, similar to a lot of Illumination projects, these films don’t even both putting meaningful story or characters first, and just want to mine as many laughs from its family audience as possible, so I don’t know why you would go into this wanting the same kind of experience you would when seeing a Pixar or Laika film, because you are certainly not going to get that. What you are going to get, however, is a bunch of silly humour that I’ll admit to laughing at several times during this movie, even in parts that are probably not meant to be that funny but are because the Minions are involved in some way. I don’t hate the Minions as much as I know a lot of other people do, and when they’re not so in-your-face they can generate a lot of silly laughter – the closest to them being so in-your-face it was almost unbearable was the Minions movie where they were the main focus, but even then I don’t mind them so I was able to tolerate it just enough – and here they are the cause of much of the fun I was having during a lot of this. Outside of the Minions, however, Trey Parker is just having the time of his life in this villain role, which is surprising because he’s used to doing far more adult fare like South Park and Team America but here he really embraces the child-friendly nature of this script and the character he’s playing. Not only is he very funny in this role, but Balthazar Bratt is easily the best character in the entire movie, because his backstory and 80s-themed get-up and weaponry – from wearing shoulder blades and an extraordinarily dated hairstyle, to using a keytar as a sound-blaster – show that the filmmakers had some good ideas when putting this together, and a lot of that had to do with the design and layout of this one villainous character. Sadly, that also ties into the film’s biggest weaknesses, and they once again are the main characters. Carell’s Gru just doesn’t have anywhere to go at this point, and neither do Wiig’s Lucy or even the young girls that Gru adopted in the first film, so all their storylines in this one feel like stitched-together episodes from a proposed Despicable Me television series, and are here just to give the characters something to do just to pad out the running time. A lot of these plots end up going nowhere, as though they were indeed conceived to begin and finish within a ten or fifteen minute runtime, and the ones that do form more of a concrete narrative represent the film at its weakest; aside from doing what is considered a “jumping the shark” plotline of introducing a twin brother, Dru is an annoying addition to the main cast of characters, and although Carell gets the chance to do a duo role here he does little to make this new character more endearing than he is written to be. But like I said, you know going in that you’re not going to get a meaningful story or complex characters, but you’re instead going to get several Minion-sized fits of giggling, and enough physical slapstick to satisfy the little ones, and Despicable Me 3 delivers all those things and more in spades. If that’s what you want then enjoy, and if not then that’s fine too; me personally, I found it to be a cute little time-waster that left me with a fun feeling inside, especially when I think of the Minion-hating parents that are going to have to drag their little ones to this whether they like it or not: call it schadenfreude, but I call it just another day in the life of this franchise. 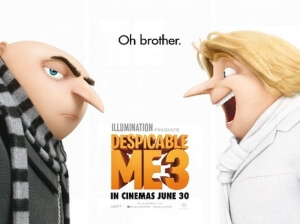 Despicable Me 3 offers more of the same type of zany, silly humour that previous entries into this franchise have perfected, and while the main characters don’t get that much development and the story is very toddler-friendly, none of that matters because you’re having a fun enough time, especially whenever the Minions are on-screen.